10 of the Most Haunted Places in America! "America the beautiful" is also "America the haunted." The country has a lot of history that's much darker than what you learned in school. Gruesome murders, sadistic torture and tragic accidents have left their mark -- and just like bloody footprints, the imprints of those violent occurrences are hard to get rid of. These ten places are favorite destinations for ghost hunters, psychics and general fans of the paranormal. 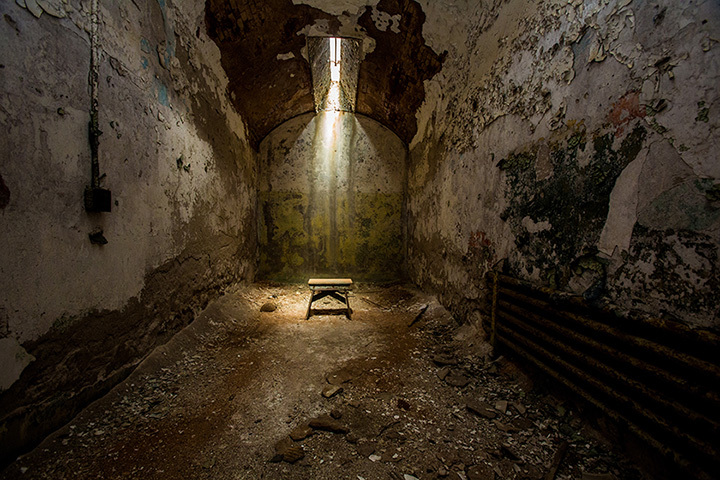 So if you're up for a different kind of American history, forget the Washington Monument: set foot inside these spooky spots....if you dare! When it was a carriage house, it was owned by former Vice-President Aaron Burr. For decades, it's been a restaurant, as popular for its spooky tales as for its food. Burr's ghost has been spotted frequently, once by a workman who was so startled, that he fled, leaving his toolbox behind (it's still there). Women sitting at the bar often find one earring go missing - and they're never found. Perhaps it's the work of another oft-seen specter -the ghost of Burr's daughter, Theodosia? Between 1829 when it opened (supposedly as a model prison) and it's closing in 1971, the horrific amount of torture that took place here reached epic proportions. Inmates were soaked in water and put outside in the freezing winter months, One prisoner had a chain looped from his tongue to his wrists - and for added misery, his hands were then chained behind his back. Inmates went mad after being left in solitary confinement for weeks. No wonder it's one of the most popular destinations for ghost hunters. Considering that about 10,000 men died in this historic battle, no surprise that a few ghosts would remain. Many visitors have thought they were watching Civil War re-enactors on the field - only to discover they were seeing actual ghosts reliving those bloody days. But phantoms aren't limited to the battlefield: several buildings in town that were constructed over mass graves have witnessed apparitions, too. The ghost of Abraham Lincoln has frequently been spotted roaming the halls of 1600 Pennsylvania Avenue, by notables including Eleanor Roosevelt. President Harry Truman saw the specter of his predecessor, Andrew Jackson - and even heard him swearing in the next room. Former First Lady Abigail Adams has also been seen floating through the halls. In the early part of the 19th century, Madame Delphine LaLaurie was a popular hostess in the French Quarter. But her aristocratic bearing hid a fiendish personality: when a fire broke out in 1834, slaves were discovered in the house, starved, chained and mutilated from her gruesome experiments. Ghostly activity includes lights glowing in darkened rooms, screams emanating from deep within the house, and the ghost of a slave girl who fell from the roof while being chased by LaLaurie. Built in 1796, this plantation (now a B&B) has had plenty of time to build up its spooky reputation. The ghost of a Confederate soldier has politely asked guests to vacate his room. The spirit of a slave named Chloe mournfully wanders the grounds, having been hung from a tree for poisoning her master's wife and children. And the footsteps of lawyer William Winter are heard on the porch - the place where he was shot in 1871. The exterior was used in the movie version of Stephen King's, "The Shining" - and a stay here by King inspired the creepy story. Staff and guests regularly report hearing music playing in the empty ballroom, ghostly children giggling in the halls and bags that get mysteriously unpacked. All that's missing is Jack Nicholson and his axe. This ocean-liner-turned-floating-hotel is said to be home to 150 different ghosts, and is not just one of the most haunted places in America, but in the world. Among those who still wander the ship is a staff member who was murdered in one of the cabins (B340, if you're feeling brave), a sailor accidentally killed when an engine room door crushed him, and some children who drowned in one of the ship's swimming pools. This Hollywood Boulevard hotel opened during the 1920s as one of the most luxurious places in Tinseltown. As the years went on, various stars made it their home while filming - or when they just needed to hide out for a bit. Early in her career, Marilyn Monroe was one resident. Her image is said to be visible in a full-length mirror that once hung in her room (it's now in the lobby). The ghost of Carole Lombard has also been spotted by many staff members. Montgomery Clift was a guest while he was rehearsing for "From Here to Eternity" -- and there have been frequent complaints to the front desk that someone is practicing the bugle in his former room. But it's vacant. It's built on the site of a gallows - so is anyone surprised that it's a hotbed of ghost activity? In fact, it's considered the most haunted house in America. The spirit of Yankee Jim Robinson, who was hung there, still makes his presence known, as does daughter Violet Whaley - who committed suicide. Even the family's former dog makes ghostly appearances, dashing down the front stairs and into thin air.